These two kittens are having some fun. With Alex tickling Jojo's belly. Their individual disc shaped name tags bear ditties revealing their lovable nature, and humorous antics. Beautifully packaged in printed boxes, each one comes with a factual presentation card on the artist & sculptor. 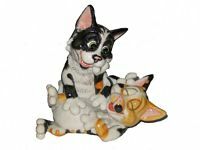 Price quoted is for 1 Alex and Jojo Kittens figurine. Millie is a Tabby Cat and is looking for a home. 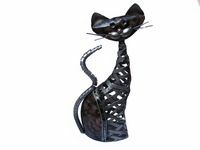 Price quoted is for 1 Millie Kitten Lying figurine. 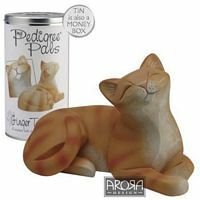 Marmalade the ginger cat is one of a range of humorous collectible animal figures by Arora Design. You can personalise your pet by giving your “Little Paws” their own name. Ideal gift for all animal and cat lovers. 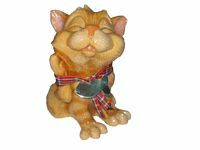 Price quoted is for 1 Marmalade Ginger Cat figurine. 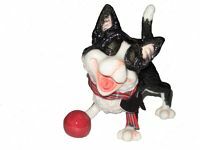 Jess is a lovely black and white tabby cat figurine from the Little Paws range. A high quality collectable, the heirlooms of tomorrow. 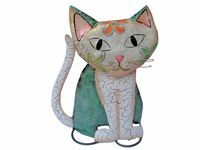 These ornaments are great gifts for the cat lover in your life and make great gifts for special occasions. Price quoted is for 1 Kitten Stretching figurine. With a very "pleased with myself" look, the Surfboard is sure to receive some admiring glances. Head is attached by a spring, so it wobbles at the slightest touch. 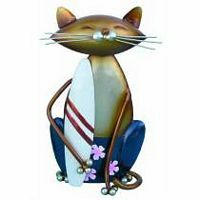 Price quoted is for 1 Purple Surfboard Character Cat. 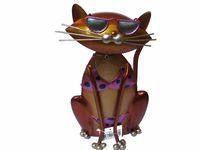 The Bikini Cat epitomises "being cool." Head is attached by a spring, so it wobbles when touched. Price quoted is for 1 Purple Bikini Character Cat. These Polyresin cats stand elegant and regal. Made from Polyresin. Looks like wood. Price quoted is for 1 set of 2 Polyresin Cats. Made from tin or metal and painted with colourful enamel with a Capiz Shell Face. 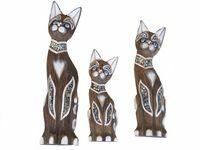 A beautiful set of 3 black and white cats with a diamond shape mirror detail on their forehead and mirror detail on their front legs. Made from wood and made in Bali. The set of three weigh approximately 905g. The set of three cats are 30cm, 40cm and 50cm in height. Price quoted is for 1 set of 3 cats. 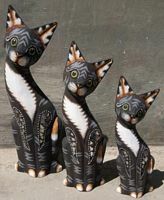 A beautiful set of 3 brown and white cats with mirror detail around their neck, on their front legs and eyebrows. The set of three weigh approximately 1023g. 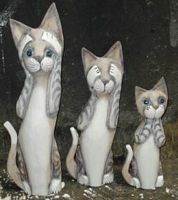 A beautiful set of 3 white wash and grey cats illustrating hear no evil, see no evil and speak no evil. The set of three weigh approximately 1240g. The set of three cats are 34cm, 45cm and 60cm in height. 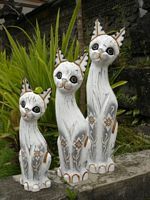 A lovely set of 3 white wash cats with floral design on their front legs. 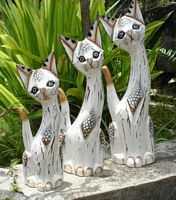 Another wonderful set of 3 white wash cats. The set of three weigh approximately 247g. The set of three cats are 20cm, 25cm and 30cm in height. Price quoted is for 1 set of 3 small white cats. 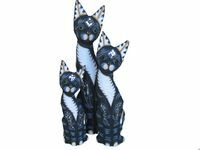 Another wonderful set of 3 black and white cats with a small amount of mirror detail on their front legs. The set of three weigh approximately 230g. Price quoted is for 1 set of 3 small black and white cats. Purchase singularly or purchase a set of 2. 'My Pedigree Pals' from Arora Design, are a growing range of popular cat breeds that will appeal to all animal lovers. Each cat is beautifully sculpted to capture those adoring expressions and unique personalities. Expertly decorated and highly tactile all finished with bright glossed noses. 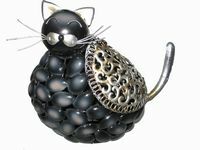 Each figurine, designed & created in the UK, highlights the characteristics of each adorable cat. 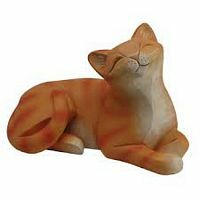 This solid resin figurine of a sweetly contented cat is heavy enough to serve as a paperweight. Each figurine in the My Pedigree Pals line comes in a gift tin which becomes a bank once emptied. Can bank/gift tin is quite large (8-3/4" tall x 5" in diameter) and has a bone-shaped slot in the lid large enough to accept bills as well as coins. Made from solid hand-painted resin. Approximately 3 1/4 inches in height and 5" (13cm) in length. Please note that colour and markings may vary slightly from the picture. 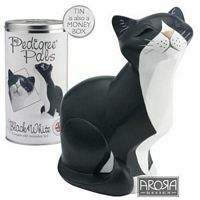 Black & White Cat from the My Pedigree Pals by Arora Design. 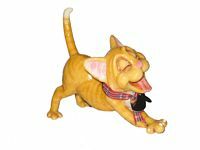 Adorable and cute My Pedigree Pals will make the perfect gift for any cat lover, and this charming figurine is part of the collection that won the Gift of the Year "Collect It" winners 2012. It is beautifully smooth to the touch and packaged in a coordinating tin which can be used as a practical money box when the item has been removed. The 'My Pedigree Pals' range is designed and created in the UK and was winner of one of the Giftware Association's 'Gift of the Year 2012' awards. Colour and markings may vary slightly from the picture. Price quoted is for 1 Pedigree Pals Black and White Cat. The My Pedigree Pals range would make the perfect gift for any animal lover. Each figurine is contained in a tin cylinder that doubles as a money box.Details and characteristics are contained on the tin's label. The artist has ensured that he incorporates each breeds specific personality and characteristics in his designs. Heavy enough to also use as a paper weight. 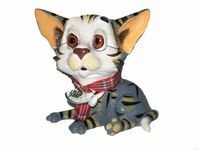 The Siamese Cat figurine was part of the collection that won the Gift of the Year "Collect It" winners 2012. Price quoted is for 1 Pedigree Pals Siamese Cat. Approximate height of glass cat is 11.5cm. Price quotes is for 1 Blue Glass Cat.